These Arsenal fans on Reddit are in a state of disbelief at what many clearly feel is extremely biased commentary from Tony Gale. Below is a video clip of an incident from Arsenal’s game against Watford today, with Troy Deeney charging into Lucas Torreira rather aggressively. 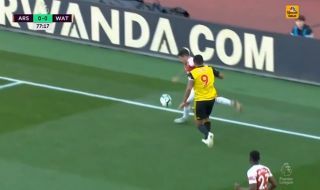 Over the top of the footage, however, Gale can be heard criticising Torreira for kicking through Deeney. Admittedly, this is a pretty ridiculous claim from the co-commentator as he essentially blames the Gunners midfielder for continuing his follow-through after making a clearance that was charged down rather pointlessly by Deeney.